A customer of ours recently came to us saying they were disappointed with click rates relating to their push notification campaigns. And although we love to remind people at any given opportunity that click rates are borderline irrelevant (focus on engagement folks! ), nevertheless we felt it was worthwhile taking a closer look at the problem. This particular campaign saw a whopping 1.2 million push notifications delivered in one go with the purpose of letting users know about a great offer available to all. What could possibly go wrong? Well, the organization in question was disappointed to find out that there were only 16,500 clicks from the 1.2 million push notifications - a 1.38% click rate. This isn’t really all that surprising a figure, and comes close to the average click rate for iOS push notifications (1.2% - although note the typical rate for Android is a decent amount higher), but they nonetheless expected better. And who can blame them? A response rate of 1.4% might feel like some sort of an achievement, but flipping things around it could fairly be argued that the business is teaching 98.6% of customers to ignore them. No surprise perhaps, but the campaign was exponentially more effective with users who had been active in the app over the previous month - a group containing 100,000 people. We’ll class these as active users. 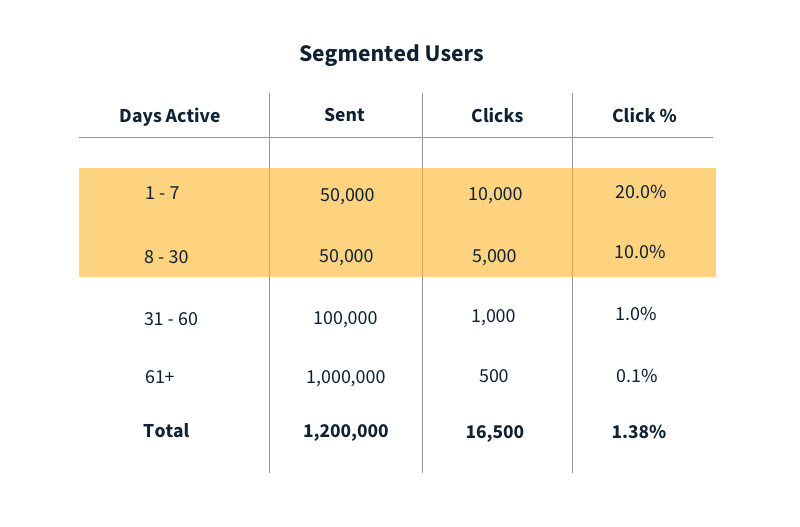 Users active within a week saw the highest click rate - 20%, or 60.6% of all clicks - with a gradual decrease in interaction over the next 3 weeks to 10%. This shows an impressive 15% click rate overall amongst active users of the app. Crack open the champagne! Hang on there just a second pal. Put that mug of bubbly down. The results for 100,000 active users are great, but they’re not so hot for the rest of the 1.1 million ‘inactive’ users. There were just 1,500 clicks, with an overall click rate of 0.14%, from 1.1 million push notifications. It doesn’t take a data scientist to figure out that this is simply not working. Active - First impressions leave a lasting effect on how you’re perceived, and this is especially the case with push notifications. Get off to a good start by doing all you can to send personalized, relevant and contextual push campaigns, localized to the user’s default language and sent at a suitable (or optimal!) time. Deeplink these push notifications to the relevant in-app locations, such as account creation or in-case-you-missed-it feature discovery. Golden rule - deliver smart push as the ‘outside the app’ part of our service, and NEVER teach your audience to ignore you. Lapsing - This stage is crucially important - when users are going, but not quite gone yet. As you can see from the sharp decline in click rates from 8-30 days to 31-60 days, it gets much harder to interact with users the longer they have been inactive, so the earlier in this stage you act, the better. Push is still effective, but be prepared to deliver the best possible experience if you are successful in enticing them back. A customized secondary onboarding campaign is strongly advised, with emphasis on feature discovery for users who have not used or are not aware of some of your app’s core features. Lapsed - The figures show that push is simply not effective for bringing back lapsed users, or it is effective in the sense that randomly firing off carrier pigeons might be effective. They’ve made up their mind that they don’t want or have a need to use your app and there is a good chance they’ve deleted it. You’re going to have to try different channels in your last heroic attempts to bring back users. Exporting mobile data and using it for retargeting across social channels and the web is certainly one of the more effective ways to regain the attention of lapsed users. And there is always the old faithful - email - which can be enriched with mobile data as well, providing a contextual and truly multi-channel experience that might just convince lapsed users to give your app another go.